Hothead Games was founded in 2006 and took the plunge into mobile games in 2011. This move has proved very successful, allowing the company to continue growing into 2016 by creating and publishing great games exclusively for mobile users. Following their experience with Google Play games services in Rivals at War: Firefight they plan to include its features in all their games. To start, the Google Play games services sign-in icon was given a prominent position on the home screen so it was clear and easily accessible. They then added leaderboards with their own beautifully designed badges as well as achievements. 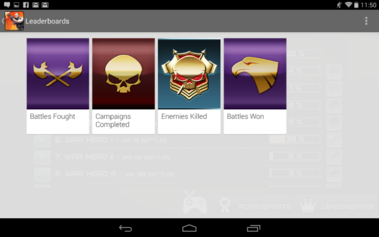 Both were aligned and displayed with related in-game missions showing players their progress and rewards earned. Notifications were used to give players instant gratification when achievements were unlocked. Day one retention 125 percent higher and day seven retention 182 percent higher. See examples of how Hothead Games integrated Google Play games services leaderboards and achievements into the UI of Rivals at War: Firefight. Find out how to add leaderboards and achievements to your games and discover more about using Google Play games services in your games to increase player engagement and revenues.